Jean-Luc Van Den Heede now with renewed vigour to complete the Race after deciding to repair his mast at sea. Jean-Luc Van Den Heede, the embattled race leader struggling with a damaged mast sustained during a storm 1,900 miles west of Cape Horn, has decided to continue in the race back to Les Sables d’Olonne. 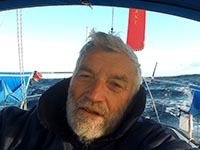 In a dramatic satellite phone call to Race Chairman Don McIntyre early today, the 73-year old solo circumnavigator who continues to enjoy a 1,500 mile lead over second placed Dutchman Mark Slats, said that he had decided to make the best repair he can at sea and continue in the race. The Frenchman told McIntyre “The worst that can happen is that I lose my rig, and I have my jury rig at the ready. Don added. “This makes a real race to the finish. Mark Slats (Ohpen Maverick) has around 90 days to catch up and now needs to average 1 knot more than Jean-Luc over the remaining distance back to Les Sables d’Olonne. This means that Mark has a real incentive to beat Matmut on his own terms, while Jean-Luc must push as hard as he dare within the limits of his damaged mast”. Van Den Heede has applied for a time penalty to be added to his circumnavigation time after he used his satellite phone twice after the mast was damaged to call his wife. The GGR rules only allow sat-phones to be used as a safety measure to call Race HQ. All other communications must be made via HF, VHF or Ham Radio Net, just as they were during the first Sunday Times Golden Globe Race in 1968/9. 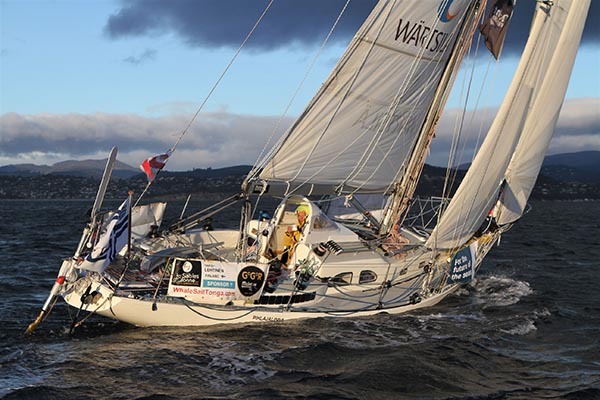 Finnish skipper Tapio Lehtinen finally reached the BoatShed Com Hobart film gate in 6th place on Tuesday after a 54 hour sleepless battle against fickle winds to sail round the bottom of Tasmania and up the Derwent River. His Gaia 36 yacht Asteria suffered a terminal engine failure early in the race, and without oars, the Finn had no other option but to wait for the wind to fill in. “I have been learning to manoeuvre my 6 Metre yacht without an engine for 36 years, but this boat is a little clumsier, especially with all the goose barnacles on the rudder.” He explained when finally at anchor. After spending the night at anchor, Lehtinen extended his stay by another 10 hours to check his rig and fix a halyard issue at the top of the mast. He eventually set sail again at 18:30 local time to chase after 5th placed Istvan Kopar, having spent 36 hours at the Hobart Gate. The next GGR boat to arrive at the BoatShed.com Hobart film gate should be Australian Mark Sinclair sailing his Lello 34 Coconut. He has posted an ETA of December 15.